The Bristol team : (from left to right) Anthony Laing, Chris Sparrow, Jacques Carolan and Christopher Harrold. 1Centre for Quantum Photonics, H. H. Wills Physics Laboratory, and Department of Electrical and Electronic Engineering, University of Bristol, UK. 2Department of Physics, Imperial College London, UK. In our recent work , we demonstrate a single reprogrammable optical circuit that is sufficient to implement all possible linear optical protocols up to the size of the circuit. Since 1897, when it was shown by the German mathematician Adolf Hurwitz, it has been known that any unitary matrix can be built up from smaller 2 X 2 matrices . Then in 1994 Reck et al. showed that any arbitrary unitary can be realised via some physical process . In particular, they showed that if we use a certain arrangement of reconfigurable linear optical elements, we can perform any unitary matrix. This network can be implemented as a sequence of ≈ m2/2 two-mode primitives with two free parameters. These primitives are built out of variable reflectivity beam splitters and phase shifters. 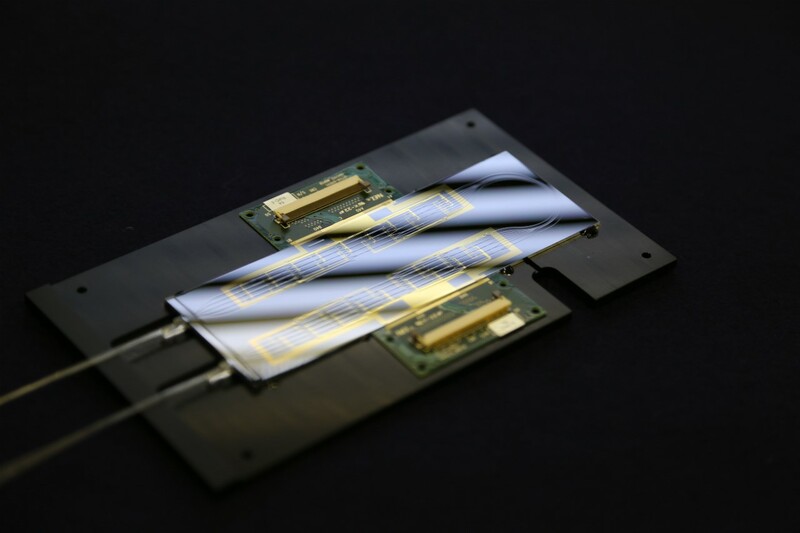 The beam splitters are comprised of a phase shifter sandwiched between two directional couplers, known as a Mach-Zehnder interferometer (MZI). By tuning the phase inside the interferometer we can arbitrarily split the light between the two outputs of the interferometer. A phase shifter placed on the output of the interferometer allows us to tune the phase of the resulting state. The phase shifters are resistive heaters patterned above a small region of waveguide. A change in temperature changes the local refractive index in the waveguide with respect to another and thus realises a phase shift. Cascading these primitive units into the triangular arrangement, together with full control over these phase shifters allows us to configure any linear optical unitary on six modes. Our device was fabricated by Japanese company Nippon Telegraph and Telephone (NTT), the world’s leading telecommunications company. The six-mode universal system consists of 15 MZIs with 30 thermo-optic phase shifters integrated into a single photonic chip that is electrically and optically interfaced for arbitrary setting of all phase shifters. Once calibrated, we could implement any unitary we wanted and switch between experiments that typically would have taken months to build in a matter of seconds. Figure 1: A fully reconfigurable optical chip. 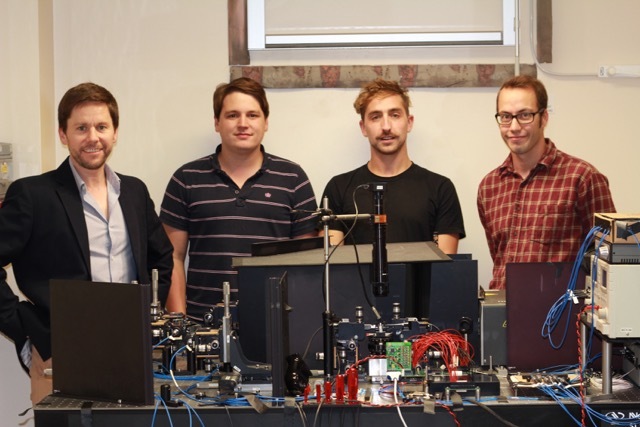 The device allows us to implement any quantum information protocol in linear optics on up to 6 modes. We realised heralded quantum logic gates  designed to be scalable for the circuit model of quantum computation (QC) for the first time in integrated photonics. We also implemented a heralded entangling gate and used measurements in different bases to verify the successful generation of an entangled state. Entangling gates such as the one implemented here are an essential requirement for one of the most promising routes to photonic QC, measurement based quantum computing [5, 6]. Not only were we able to perform these protocols, but importantly we were able to report experimental results with high fidelity. We then turned our attention to a completely disparate aspect of linear optics and configured our device in order to perform boson sampling. Boson sampling is a computational task with one objective: sampling from a probability distribution governed by the output statistics of photons injected into a fixed linear optical network . It provides a rapid route to demonstrate the intrinsic exponential advantage a quantum computer has over a classical one. We implemented 100 instances of the boson sampling problem, injecting up to three photons into our circuit and reproduced the expected theoretical probability distributions with exceptional fidelity. We also investigated techniques used to verify the successful implementation of Boson Sampling by implementing a family of unitaries known as the quantum complex Hadamards . These sorts of techniques will be crucial in the future when the circuits and number of photons used mean that classical verification will be intractable even for the most powerful classical computers [9, 10]. Crucially, the reconfigurable circuit allows us to carry out Boson sampling and the verification protocols all on the same device. The chip’s ability to implement arbitrary circuits promises to replace a multitude of existing prototype systems as well as providing a platform for those yet to be discovered. The results presented in  required ~ 1000 configurations of the device and point the way towards applications across quantum technologies. Jacques Carolan, Christopher Harrold, Chris Sparrow, Enrique Martín-López, Nicholas J. Russell, Joshua W. Silverstone, Peter J. Shadbolt, Nobuyuki Matsuda, Manabu Oguma, Mikitaka Itoh, Graham D. Marshall, Mark G. Thompson, Jonathan C. F. Matthews, Toshikazu Hashimoto, Jeremy L. O’Brien, Anthony Laing, "Universal linear optics", Science, 349, 711 (2015). Abstract. A. Hurwitz, "über die Erzeugung der Invarianten durch Integration", Nachrichten von der Gesellschaft der Wissenschaften zu Göttingen, Mathematisch-Physikalische Klasse, p.71 (1897). Full Article. Michael Reck, Anton Zeilinger, Herbert J. Bernstein, Philip Bertani, "Experimental realization of any discrete unitary operator", Physical Review Letters, 73, 58 (1994). Abstract. E. Knill, R. Laflamme, G.J. Milburn, "A scheme for efficient quantum computation with linear optics", Nature, 409, 46 (2001). Abstract. Robert Raussendorf, Hans J. Briegel, "A One-Way Quantum Computer", Physical Review Letters, 86, 5188 (2001). Abstract. Daniel E. Browne, Terry Rudolph, "Resource-Efficient Linear Optical Quantum Computation", Physical Review Letters, 95, 010501 (2005). Abstract. Scott Aaronson, Alex Arkhipov, "The computational complexity of linear optics" in Proceedings of the ACM symposium on Theory of Computing, pp.333-342 (ACM, New York, 2011), Abstract. Anthony Laing, Thomas Lawson, Enrique Martín López, Jeremy L. O’Brien, "Observation of Quantum Interference as a Function of Berry’s Phase in a Complex Hadamard Optical Network", Physical Review Letters, 108, 260505 (2012). Abstract. Jacques Carolan, Jasmin D. A. Meinecke, Peter J. Shadbolt, Nicholas J. Russell, Nur Ismail, Kerstin Wörhoff, Terry Rudolph, Mark G. Thompson, Jeremy L. O'Brien, Jonathan C. F. Matthews, Anthony Laing, "On the experimental verification of quantum complexity in linear optics", Nature Photonics, 8, 621 (2014). Abstract. Malte Christopher Tichy, Markus Tiersch, Fernando de Melo, Florian Mintert, Andreas Buchleitner, "Zero-Transmission Law for Multiport Beam Splitters", Physical Review Letters, 104, 220405 (2010). Abstract.